Some like to go undefeated, I on the other hand, choose to do it the Detroit Lion way. Winless. I thought Kerry Collins would turn back the time machine on us, wrong. I was certain the 0-5 on the East Coast, Arizona Cardinals, would get diced up by Carolina's rushing attack, wrong again. Woke up Sunday morning, for sure the defending champs would bring Donovan back to planet Earth, wrong. Finally, here was my pick to show you how smart I am, Phil Rivers would come out, dice up the Steeler secondary, and spite everyone in the NFL who didn't vote him to the Pro Bowl. Stunner, wrong again. Now I admit, pinning my hopes on a Norv Turner coached team may not have been all that bright, in fact it was probably down right stupid. However, on the same weekend we watch Tom Coughlin, Jeff Fisher, and Jon Fox lose home playoff games after having 14 days off, anything could have happened. Let's sign off on . . . The Tennessee Titans whose 13-3 regular season record, meant jack come Saturday afternoon. The Titans, to be fair, outplayed the Baltimore Ravens. Tennessee rushed the ball for 116 yards, and held the Ravens to just 50 yards on 30 carries. Kerry Collins completed 25+ passes and finished just 19 yards shy of 300. While Raven rookie quarterback, Joe Flacco, completed just 11 passes for 161 yards. The Titans finished with 180 more total yards than the Baltimore Ravens. If we stopped there, what would you guess the score was? 34-17, maybe. Unfortunately for the Titans, they couldn't put the ball in the end zone against Ray Lewis and company. I watched Tennessee drive up and down the field for four quarters, they stretched out Ed Reed, who finished with just 4 tackles and 0 interceptions. Yet every time the Titans crossed the twenty, they panicked. LenDale White fumbled the ball inside the twenty, Kerry Collins threw an interception inside the twenty, and just as you thought the Titans would finish a drive off, tight end Alge Crumpler, caught a Collins pass then proceeded to get the ball knocked out of hands and the drive ended. In typical Raven fashion, one big play from Joe Flacco in the first quarter, a 48-yard bullet to Derrick Mason, would prove to be enough, oh and two timely Matt Stover field goals. No one remind first year Raven head coach, John Harbaugh, that we've already voted for coach of the year, and unfortunately it wasn't him. Maybe it should have been. The Carolina Panthers Yes, I picked them to win this game, and they lost. May I remind you that when I published The Impact Five, I told you that Jake Delhomme would be very important in the postseason. On Saturday night, he showed you why he was so important. One touchdown and five interceptions later, you now see that in order for the Panthers to win, Jake Delhomme needs to not throw five completions to the other team. The vaunted Panther rushing attack put just 75 yards on the board while Arizona ran for 143 yards. This game was by far the most shocking off the weekend. For starters the Panthers were the NFL's only undefeated team at home this season, 8-0, and as I said in the lead off, the Cardinals were 0-5 when traveling to the East Coast this season. So yea, give me a break I didn't see an Arizona 33-13 tail kicking coming. More importantly I'd like to officially let Terrell Owens, Randy Moss, and Steve Smith know, they are no longer the NFL's best receivers, in case they didn't know already. The 6-3, wideout on Arizona, otherwise known as Larry Fitzgerald, is flat out the best. 14 catches for 267 yards in two playoff wins this postseason, Fitzgerald is solidifying himself as THE big game NFL wideout. The Cardinals played no defense, barely ran the ball, and couldn't win on the road in the regular season. The postseason however, has been a different story. 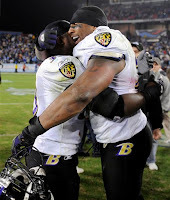 The victory over Atlanta in the first round featured a defense which shut down All-Pro back, Michael Turner. Now the second round victory featured a win over an undefeated home team playing on the East Coast, something they couldn't do all season. I'm left to think that if Detroit was playing in the postseason, they might even have a win. The New York Giants need to get bashed right now. Losing Plaxico Burress did hurt you, just come out and say it. He was way to much of a distraction and it knocked the Giants off their course. Eagles defensive coordinator, Jim Johnson, knew it would and it did. The first quarter of their loss to the Eagles featured a quarterback more frustrated by the wind than I've ever seen him. He couldn't hit open men, and when he did, his passes looked like wounded ducks. Eli couldn't connect for any big plays and turned the ball over in the worst possible spots. This loss goes on Eli, that's it. Their rushing game which was great all year long, hung 138, Eli's 15/29 with two picks couldn't win the game. What more can you say about the Eagles? This team was left for dead 6 weeks ago, and they should have been. They've won with their defense, point blank. Brian Dawkins making 10 tackles, 8 solo, he makes their defense tick. I'm not impressed with Donovan's performance, I'm never impressed with this guy. He still makes dumb calls, including the pretend call which resulted in a 15-yard unsportsmanlike, and he goes just 22 of 40 with two interceptions. 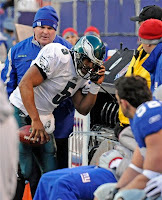 The same way this Eagles team beat Dallas, Minnesota, and now New York, is with their defense. Brian Westbrook's 46 all purpose yards doesn't do much. Eagle kicker, David "Green" Akers banged out three field goals. A first-quarter interception and 25-yard return from Asante Samuel, set up the Eagles within in the five yard line. The 2008 Eagles, no offense, no problem. The San Diego Chargers allow me to introduce to you, a healthy Willie Parker. Now that you've seen what it is like when your All-Pro running back plays in big games (27 carries, 146 yards), here's a coach ticket back to San Diego on the first flight from Pittsburgh. 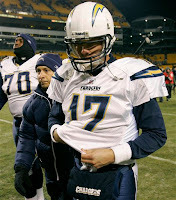 Before I tout the Steelers, I want to officially take my hat off for Phil Rivers. The man is a baller, don't even say otherwise. At halftime, Steeler head coach, Mike Tomlin must have had one message, KEEP HIM ON THE SIDELINE. Rivers turned out another great game, 21 of 35 with 305 yards passing and 3 TD's. His performance down the stretch in 2008, 263 yards a game and 2 TD's on average over their final six games, including two playoff games, coupled with playing injured in the AFC championship against the Patriots at Foxboro last season, you can give him due now. I will carry the Phil Rivers flag from now on, and feel pretty comfortable doing it. When your watching super Brett throw interceptions in the Pro Bowl, remember the guy who got left off the roster. Unfortunately for Phil Rivers, the Steelers kept him on the sideline in the third quarter, and it won them the game. In the third quarter alone, the Steelers controlled the ball for 14 minutes and 43 seconds, leaving Phil just 17 seconds on offense. By the time he got another opportunity to bring his team back, they were already down by two scores. His 107 yards in the fourth quarter and two touchdowns weren't enough to bring them back. The Pittsburgh defense knows how to play at home, they control the ball and keep your offense on the sideline. So my 2-6 record this postseason will keep me from going above .500 on the season, but we'll be back mid-week for the Conference Championship Preview. In the words of Mike Tomlin, "Ravens and Steelers, It would be big if it was a scrimmage. This is for the AFC Championship."